A quick, single serve dish that is full of flavor! 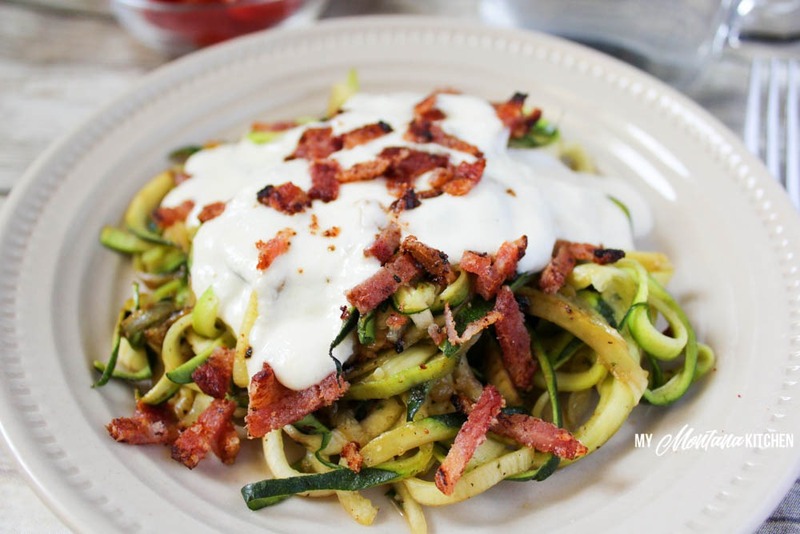 Perfect for a fast lunch, this zucchini dish has a luscious creamy sauce, with bits of crispy bacon. This recipe is low carb, gluten free, and a Trim Healthy Mama – S dish. for Christmas a couple years ago, and it works perfect for this dish! It is easy to hold and easy to clean (because I can throw it in the dishwasher)! That is my style! It won’t be long before zucchini will be in season and our neighbors will be begging us to take some off their hands. I will be very happy to help them out! Zucchini, on its own, does not have a very distinct flavor – in fact it really does not have any flavor at all! That is one reason why it is perfect for this easy alfredo. 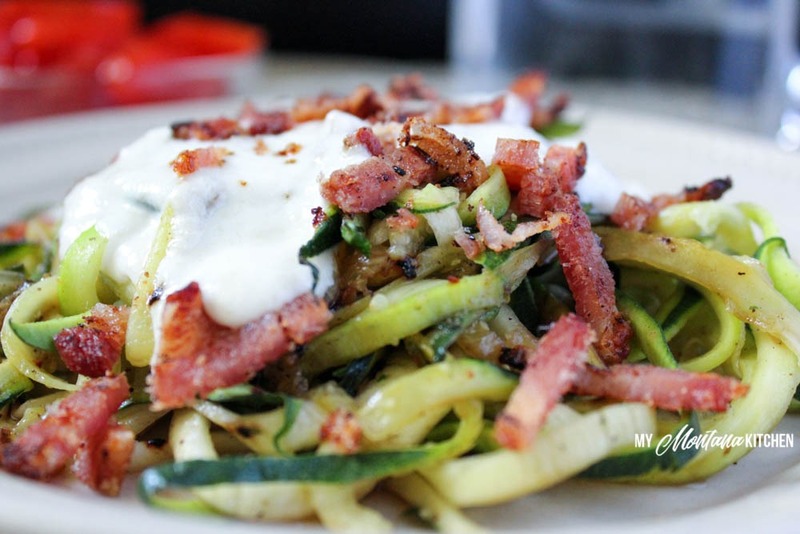 The zoodles take on the flavor of the creamy sauce and bacon! If you use pre-cooked bacon crumbles, this dish could literally be ready in less than 10 minutes! It is so easy! 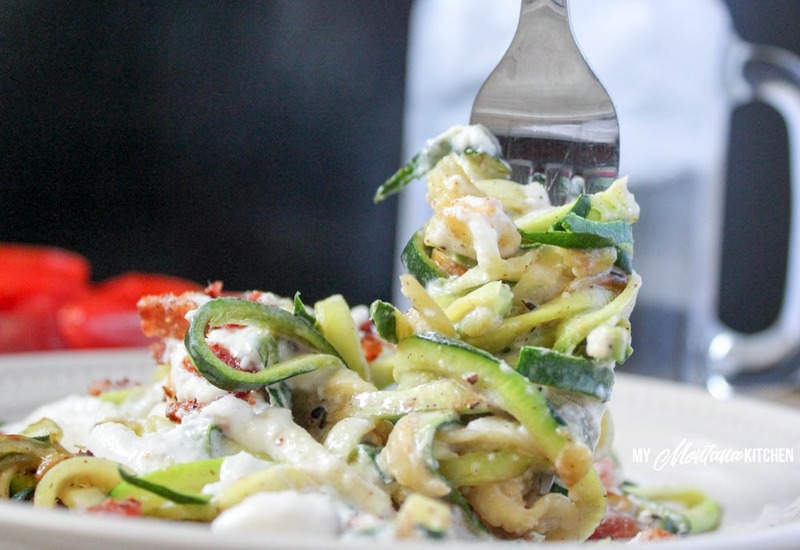 If you are looking for more zucchini recipes, check out this amazing zucchini roundup! In a medium skillet, over medium heat, fry bacon until crisp. Chop bacon into small pieces. Drain bacon grease from pan, reserving a small amount if desired. Saute the zoodles and bacon pieces in the bacon grease for 3-4 minutes, or until the zoodles begin to soften. In a separate saucepan, combine heavy whipping cream, half & half, and Parmesan cheese. Heat until mixture begins to bubble and thicken. Pour alfredo sauce over zoodles and serve. If you do not want to use two pans, feel free to just add the sauce ingredients to the same skillet with the zoodles and bacon. Cook until sauce begins to bubble and thicken. I used 1/2 teaspoon garlic salt, but it was almost too salty. Consider cutting back to 1/4 teaspoon, depending on how salty your bacon is. May I please get the nutritional info on this recipe? I have scrolled up and down but simply do not see it. I’m sorry, this post was published before I started adding macros. I agree I wish recipes had the net carbs when they claim to be low carb. Loved the recipe! Very tasty and easy!